Ann Warner has nearly twenty years of experience advocating for the rights of women and girls around the world and in the South. 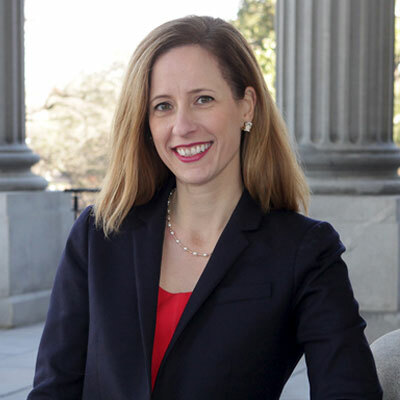 She is the CEO of the Women’s Rights and Empowerment Network (WREN), a statewide non-profit organization that is building a movement to advance the health, economic well-being, and rights of women, girls, and their families in South Carolina. As CEO, Ann mobilizes policymakers, business leaders, grassroots leaders, and citizens to remove barriers to gender equity and advance diverse women’s leadership across the state. She leads the development and implementation of a strategic plan for statewide expansion and impact; oversees advocacy, education and empowerment programs; develops partnerships; directs operations; and leads a talented team. Before moving to South Carolina to lead WREN, Ann spent eight years with the International Center for Research on Women (ICRW) in Washington DC, where she led research and advocacy initiatives to promote the health and empowerment of women and girls around the world. She was also the Co-Chair of the US national chapter of Girls Not Brides: Global Partner­ship to End Child Marriage, and has successfully advocated with the US government to prioritize the issue of child marriage. Ann conducted research on violence against women and girls in the West African nation of Liberia in collaboration with the International Rescue Committee. She has also worked for CARE USA, building support for humanitarian relief and development programs around the world, and for an HIV/AIDS service and education organization in Atlanta, GA. Ann has a joint Master of International Affairs and Master of Public Health from Columbia University and a Bachelor of Arts in English from Wellesley College. Ann is a graduate of the Riley Institute’s Diversity Leaders Initiative.